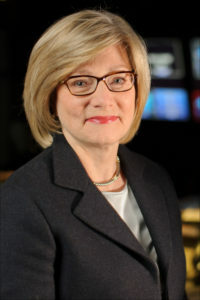 BARBARA COCHRAN, a news executive whose career includes top jobs in the broadcast, print and non-profit worlds, is the Curtis B. Hurley Chair in Public Affairs Journalism at the Missouri School of Journalism. Cochran is based in the School’s bureau in Washington, D.C., where she has spent her entire career. She works with the School’s faculty to teach and provide course content for students. Cochran also engages in programs of research, consulting and training aimed at improving the practice of journalism, working with the Committee of Concerned Journalists, also located in Washington, and the Donald W. Reynolds Journalism Institute. Cochran served for 12 years as president of the Radio Television Digital News Association, the world’s largest organization serving the electronic news profession. At RTDNA, Cochran championed the First Amendment rights of journalists, launched initiatives in ethics and diversity and led the association’s inclusion of digital journalists in its membership. RTDNA received the Missouri Honor Medal for Distinguished Service in Journalism during her tenure. Previously, Cochran served as managing editor of the Washington Star, vice president for news for National Public Radio, executive producer of NBC’s Meet the Press and vice president and Washington bureau chief for CBS News. She has supervised coverage of stories from Watergate to the Persian Gulf War and played a leading role in the coverage of every election and political convention for 24 years. At NPR, she directed the creation of Morning Edition, the program that cemented NPR’s position as an essential national news provider. During her tenure, NPR won two DuPont-Columbia Awards. Cochran has been recognized with a number of awards, including The Media Institute’s Freedom of Speech Award, The AWC Matrix Foundation’s Edith Wortman First Amendment Award, the Library of American Broadcasting’s Giants of Broadcasting Award and RTDNF’s First Amendment Award. Cochran has served as a judge for the DuPont-Columbia, George Foster Peabody and Hearst Collegiate Journalism Awards. She is a member of the Council on Foreign Relations and the Accrediting Council for Education in Journalism and Mass Communications. Cochran is co-chair of the International Women’s Media Foundation. Cochran has a master’s degree from the Columbia University Graduate School of Journalism in New York and a bachelor’s degree from Swarthmore College in Pennsylvania. When Edgar A. McLaughlin graduated from the Missouri School of Journalism in 1931 and walked out the doors of Neff Hall, he said, “If I ever make any money, I am going to do something for this place.” The chair was funded by an estate gift from E.A. and Lucile McLaughlin. Mr. McLaughlin requested that it be named not for him but for the country editor who encouraged McLaughlin to attend Missouri and lent him $400 to do it in 1927. Curtis B. Hurley was the editor of the Camden (Ark.) Evening News and the Morrilton (Ark.) Democrat. Hurley, a former Missouri journalism student, often quoted his friend Walter Williams, founding dean of the Missouri School of Journalism, to his employees. His views made a lifelong impression on McLaughlin. Ed McLaughlin credited Hurley and the Missouri School of Journalism with turning his life around. After Mizzou, he went to Tokyo to work at the Japan Advertiser. He came back to Columbia, briefly edited MU’s alumnus magazine, and after serving as a public relations officer on the Allied Headquarters staff during WWII, began a 39-year career with Brown and Bigelow. He was a district manager in the firm’s advertising sales department. He and his wife retired in Los Altos, Calif. and left the bulk of their estate to the Missouri School of Journalism.